On Friday, November 23rd Janice Doxey will be teaching a Whimsy & Grace painted canvas ornament from 10 AM to 4 PM. The painted canvas, stitch guide, all necessary threads and beads are included in the price - $88. Registration is open now through October 1, 2018. Call the shop to reserve your space. Introducing our exclusive hand-painted canvas by Danji Designs: Desert Santa. The design is 4” x 9” on 18 count canvas. It comes with a stitch guide by Nancy Yeldell. This design will be in the September/October 2018 edition of Needlepoint Now. The canvas with stitch guide are $86. Call the shop to reserve yours. We just received a brand-new stitch book in the shop by Gone Stitching – Got Stitches Too: Size Matters. The book is organized into three chapters: Straight Stitches, Diagonal Stitches, and Crossed and Twisted Stitches. Each diagram indicates for what size area the stitch would be appropriate. The alphabetical index lists the appropriate size and the category of stitch. This little gem is available for sale immediately for $32. 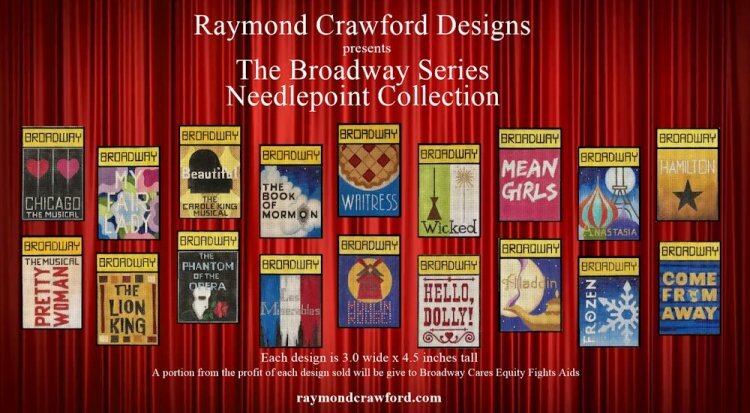 New from Raymond Crawford Designs: The Broadway Series. Each 3 x 4.5-inch needlepoint design will feature a current and/or touring Broadway musical production. The smaller size is intended to be a quick stitch and provide multiple finishing opportunities such as: ornaments, framing with show tickets, gift/ticket holders. This size of each design is meant to encourage fans of Broadway and needlepoint enthusiasts, who will most likely want to collect many from the current collection. As an act of support for the Broadway community, it is also with great pleasure to announce that with each purchase, Raymond Crawford Designs will dedicate a portion of the profit from each design to BCEFA: Broadway Cares Equity Fights Aids. For more information regarding the great work by BCEFA, go to broadwaycares.org. Each canvas sells for $49. Available shows are Chicago, My Fair Lady, Beautiful, The Book of Mormon, Waitress, Wicked, Mean Girls, Anastasia, Hamilton, Pretty Woman, The Lion King, The Phantom of the Opera, Les Miserables, Hello, Dolly!, Aladdin, Frozen, and Come From Away. Please call us at 480.990.2270 to pre-order the canvases of your favorite Broadway shows. Our resident teacher Nancy Yeldell continues to offer canvas enhancement classes on Thursday mornings from 10 AM to Noon. Two hours of tips, tricks, and ideas from Nancy for only $15 – what a deal. Call us to reserve your spot! Private lessons are available with Nancy, Charli, Janice, and Susan by appointment. Old Town Needlework opens the doors (and the tables) on Thursday afternoon and all-day Saturday for open stitching. Bring your project and enjoy the cool air, great light, and pleasant company.